Discussion in 'Subaru Levorg General Discussion' started by manumissio, Jul 7, 2017. 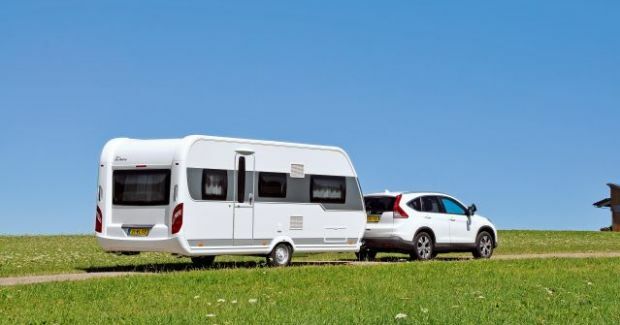 Drove in June with a caravan Hobby Prestige 495 UL (1,500 kg) to the south of France. The experiences are positive. Before I drove 13 years an Outback 3.0R. I had my doubt about the Levorg as a towing vehicle. The acceleration is not as autonomous as in the Outback (despite the sports mode), but hill-up the Levorg accelerates better. The CVT acts very autonomously, the shift flippers are redundant. The CVT automatically selects the correct gearing position. In combination with Eyesight, it is drives independent, I only steered. On the highway across the Netherlands, Belgium, Luxembourg and France I always drove 90 GPS-Km. This is the legal maximum speed for this combination in these countries and about 96 km on the speedometer. Fuel consumption in average 14L to 100Km. The temperature of the oil (maximum 106°C) and coolant fluid (98°C) was good even on the warmest days (35°C +) and on slopes and traffic jams. The ATF-oil in the CVT was significantly cooler (max. 96°C) than with the Outback 3.0R with extra ATF cooler. Max. turboboost 0,8 accelerating hill-up. The stability is better by the tighter and shorter suspension and damping without the driving comfort. Unfortunately, the Navi has no caravan or truck mode, fortunately I have a separate 7.5 "tablet with the same iGO Navisoftware as with the Subaru Navi but with adjustable caravan mode and that for € 69. Conclusion: I like the Levorg as a towing vehicle better than the Outback 3.0R with regard to automatic transmission, stability and driving comfort, but I miss the Sport Sharp Modus (S #). A little more power would be welcome. Nice review..how did you get the cvt oil temp and is your 106c engine oil temp in I mode or S mode? My engine oil temp always goes up to 110max on agressive sports driving. CVT temperature can be mesured with the android-app ActiveOBD (or integrated in the android-app Torque, in combination with an android smartphone/tab and a bluetooth OBD-adapter. A lot of other functions and be mesured with this app. With the caravan I drive in the S-mode with cruisecontrolmode if possible, normally I drive in I-mode with cruisecontrolmode if possible and only push in S-mode when I want to overhaul quickly. I normally drive very relaxed with cruisecontrol at legal maximum (GPS)speed. In the normal situation the oiltemperature is about 95-98°C. It's not a small nor a light caravan, but the Levorg has no problem with it. I drive a bit faster as trucks (HGV's) do. Overhauling these trucks is no problem, not even uphill or downhill. The accelaration uphill is excellent and downhill the combination stays stabil. Acctualy the permitted maximum mass of a trailer seems very conservative, in comparison to an Outback or a Forester with the same CVT (NA).